I had always been inclined towards the academics- books, lab, then books and more books. Though I appreciate art, I never attempted anything artisitic as I feared I wasn’t good at it. So, this was something very unique and different for me; I recently tried my hand at making pot murals, which in itself is quite different. The style of art is called Warli. 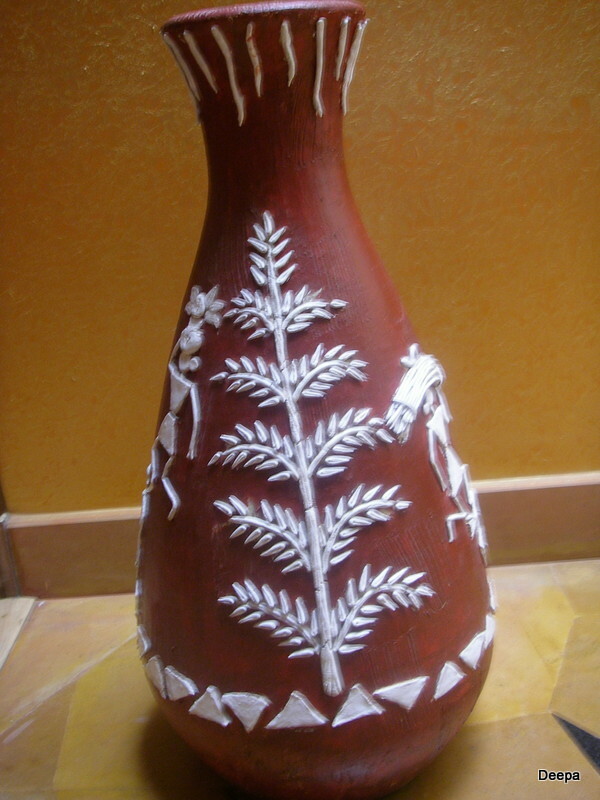 Warli paintings originated from an indigenous tribe of the same name in Maharashtra. Though the Warli paintings were discovered around 1970s, historians believe that this traditional art dates back to 2500BC. The art became popular because of its simplicity; the two-dimensional painting is largely comprised of circles, triangles and squares. The Warlis worshipped nature and the circles represent the sun and the moon, the triangles represent the mountains and trees and the square represents a piece of land. The main theme usually revolves around the rudimentary scenes of village life – farming, festivals, trees, animals. For the mural, first a dough of POP, ceramic powder,corn powder and liquid glue (fevicol) is made. After kneading it well, a little oil is mixed into it to prevent it from drying and cracking. Then a small piece of dough is flattened with a rolling pin and cut with a blade into the required shape which is then glued onto the pot, allowed to dry and then painted in white. A lot more effort and different than an actual Warli painting. 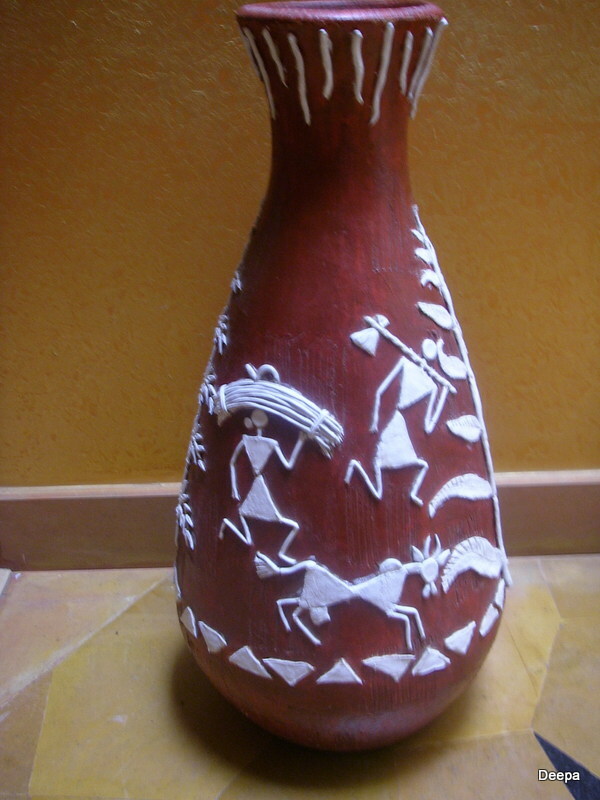 The paintings were traditionally made by women on the inner walls of their hut. The walls made of earth and cow dung provided a ochre red background for the paintings which are always white in colour. The paint is a paste of rice flour with water and gum and the paintbrush is a bamboo stick chewed at the end. As it gained popularity, it began to appear on fabrics, either in painted or embroidered form, besides the highly fashionable wall murals. A word in your ear has started a new weekly challenge: A word a week. The word this week is ‘Different’. Oh Nice! I love warli art! I even have a sari with the warli designs on it..
Nice, I love warli, and murals with pop, I would definitely try..